PHOTO: Unsolved mystery - Which one is Governor Northam? The one in blackface or the one in the KKK robe? Republicans in Virginia said Northam should step down if he's in the photo. Northam did not respond to those calls. But in his statement, he said, "This behavior is not in keeping with who I am today and the values I have fought for throughout my career in the military, in medicine, and in public service." The White House took aim at Northam, referencing the attention Supreme Court Justice Brett Kavanaugh's high school yearbook received during his brutal confirmation fight last year. "This should be easier work than parsing every word and semicolon in the Kavanaugh yearbook," White House adviser Kellyanne Conway tweeted Friday. The newest revelation comes as Northam came under fire Wednesday after he waded into the fight over a controversial abortion bill that one sponsor said could allow women to terminate a pregnancy up until the moment before birth -- with critics saying Northam indicated a child could be killed after birth. The intent of his comments was not clear. But some conservative commentators and lawmakers took his remarks to mean he was discussing the possibility of letting a newborn die -- or even "infanticide." Northam refused to back down from comments that have sparked outrage. 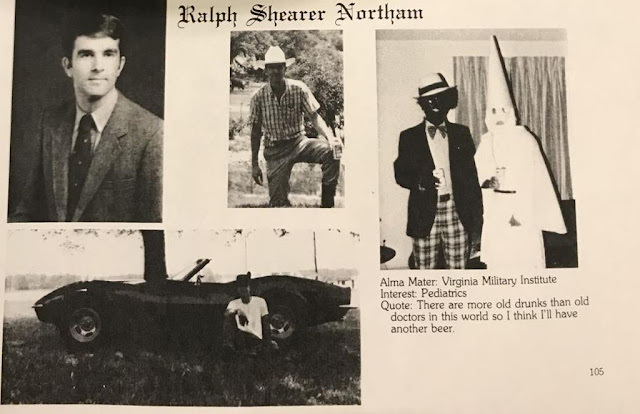 "I have devoted my life to caring for children and any insinuation otherwise is shameful and disgusting," Northam tweeted this week. “What’s shameful is that you're too cowardly to say point blank that it’s wrong to leave babies to die after birth,” Nebraska Sen. Ben Sasse said in a statement Thursday. “You could have said that yesterday. But because you’re terrified of an extremist pro-abortion lobby that now defends even infanticide, you're still ducking." Northam defeated Republican Ed Gillespie in Virginia’s 2017 gubernatorial race. During that contest, Democrats tried to link Gillespie to the torch-bearing white nationalists who infamously marched in Charlottesville. When he won, California Sen. Kamala Harris tweeted congratulations to Northam. Fox News' Lukas Mikelionis and Adam Shaw contributed to this report.